Chagatai Khan: Shaheen Sehbai VS Dr. Maleeha Lodhi & Jang Group of Newspapers. Shaheen Sehbai VS Dr. Maleeha Lodhi & Jang Group of Newspapers. WASHINGTON: An almost unnecessary, but potentially embarrassing and even damaging, controversy was unleashed in Washington some time back when Pakistan's outgoing Ambassador, Dr. Maleeha Lodhi, ordered the physical removal of a respected American university professor, a Pakistani-American, from an embassy dinner. His fault: He had expressed the view that Pakistan should not send women ambassadors to Washington. The Professor, Dr. Hafeez Malik of Villanova University, Pennsylvania, who has been editing a prestigious academic journal, "The Journal of South Asian and Middle Eastern Studies" for years and is Visiting Professor at the Foreign Service Institute of the U.S. State Department, quietly went out, disgraced before an elite crowd and vowed in his heart to take his revenge. Soon he got the opportunity when a sympathiser came to his help and pointed out to him that Dr. Maleeha Lodhi had plagiarized portions of an article published in Dr. Malik's own journal. The stage was set for pay back time. On Feb 21, 2002 Dr. Malik struck. In a letter to Ms Lodhi he wrote: "For your doctoral dissertation (from the London School of Economics in 1981), and your article on the PPP (Pakistan People's Party of Benazir Bhutto) which I published, you extensively plagiarized from Dr. (Philips Edwards) Jones unpublished dissertation, specifically pages 306. 307, 620, 623, 655, 658, 661, 665." Click here for Dr Malik's Letter http://satribune.com/archives/aug03_09_02/ML-HM-1.htm Dr. Jones is Professor of Arts and Sciences at the Embry-Riddle Aeronautical University in Prescott, Arizona. SUBJECT: Your plagiarizing from Dr. Philip Edward Jones’s doctoral dissertation, The Pakistan Peoples Party: Social Group Response and Party Development in an Era of Mass Participation, presented to the faculty of the Fletcher School of Law and Diplomacy, Tufts University, April 1979. Some months ago a friend called me for a social visit, and in the process reminded me that I had published your article, “Pakistan People’s Party and Pakistani Democracy” in the Journal of South Asian and Middle Eastern Studies, (Vol. VI, no. 3, pp. 20-31, Spring 1983). This article was based upon, as you had indicated in your introductory paragraph, the doctoral dissertation on Bhutto, The Pakistan Peoples Party and Political Development in Pakistan: 1971-77, which you had submitted to the London School of Economics and Political Science in 1981. 1. When you were researching for your dissertation on the PPP in London, Shahid Javid Burki, now retired Vice President of the World Bank, fetched for you from the United States a copy of Dr. Philip Jones’s dissertation, which had been accepted by the Fletcher School of Law and Diplomacy in 1979—two years before you completed your work. Jones’s dissertation is an impressive as well as a massive piece of scholarly work consisting of 775 pages. 2. For your doctoral dissertation, and your article on the PPP (which I published) you extensively plagiarized from Dr. Jones’s unpublished dissertation, specifically pages 306, 307, 620, 623, 655, 658, 661, 665, of his dissertation. 3. After the publication of your article, when Dr. Jones discovered the extent of your plagiarism from his dissertation, you called Dr. Jones in his office at the CIA’s Headquarters on his secret telephone number. (It remains a mystery, how you managed to obtain his secret telephone number at the CIA). 4. In addition to the telephone call, you wrote a letter of apology to Dr. Jones for flagrantly plagiarizing from his dissertation. Subsequently, I investigated this information on my own to determine its authenticity as well as its accuracy. In the academic world plagiarism is defined (1) as an act “to steal and pass off the ideas or words of another as one’s own, (2) present as new and original an idea or product derived from an existing source.” After comparing your article with Dr. Jones’s thesis I am convinced on both counts that you had stolen Dr. Jones’s ideas and words for your article, which I published in the Journal. In order to pacify Dr. Jones you apologized to him on the telephone, and then in a letter. But you did not have a shred of decency to apologize to the Editor, that is me, for your act of deception and plagiarism. You proved yourself to be literally and utterly shameless. In referring to your published article Dr. Jones has stated: “I would estimate some 60-70 percent of this paper reproduces ideas and approaches used in my Ph.D. Thesis. Much of this is rewritten with sentence or phrase here and there to indicate she consulted my work. There are, however, a number of direct and unattributed borrowings from my thesis.” However, it is difficult at this stage to determine the extent to which you might have plagiarized from Dr. Jones dissertation in preparing your own. Someone who knows better than myself has estimated that you flagrantly stole Dr. Jones’s ideas, approaches and even phrases and incorporated them in your dissertation. That is why you never had the courage to publish your dissertation in Pakistan or any other country. I have decided to make a representation to the University of London to investigate the extent of your stealing, and then determine if the award of the Ph.D. degree was justified. If not then the degree should be withdrawn. Until this determination is made, I see no reason why I should address you as Dr. Lodhi. In obviously very angry tones and in aggressive language, Dr. Malik told Ms Lodhi: After the publication of your article, when Dr. Jones discovered the extent of your plagiarism from his dissertation, you called Dr. Jones in his office at the CIA's Headquarters on his secret telephone number. (It remains a mystery, how you managed to obtain his secret telephone number at the CIA)... In addition to the telephone call, you wrote a letter of apology to Dr. Jones for flagrantly plagiarizing from his dissertation." "Subsequently, I investigated this information on my own to determine its authenticity as well as its accuracy. In the academic world plagiarism is defined (1) as an act "to steal and pass off the ideas or words of another as one's own, (2) present as new and original an idea or product derived from an existing source." After comparing your article with Dr. Jones's thesis I am convinced on both counts that you had stolen Dr. Jones's ideas and words for your article, which I published in the Journal. In order to pacify Dr. Jones you apologized to him on the telephone, and then in a letter. But you did not have a shred of decency to apologize to the Editor, that is me, for your act of deception and plagiarism. You proved yourself to be literally and utterly shameless." Even these harsh words did not cool down Dr. Malik as he had been publicly disgraced. Ms Lodhi did not respond to his letter, expecting that with time the issue will pass. It did not. Dr. Malik sent a copy of her article to Dr. Jones for review and comments. The ERA University professor confirmed that the article had borrowed "up to 70 per cent" of his ideas. Click here to see Dr. Jones' notes on her published article http://satribune.com/archives/aug03_09_02/ML-Th-2.jpg This was more ammunition for a still very angry Dr. Malik to get even with the lady. Subject: A representation recommending that Ambassador Maleeha Lodhi of Pakistan should be declared a persona non grata and sent home for plagiarizing from Dr. Phillip E. Jones’s Doctoral dissertation, The Pakistan People’s Party: Social Group Response and Party Development in An Era of Mass Participation, presented to the faculty of Fletcher School of Law and Diplomacy, Tufts University, April 1979. 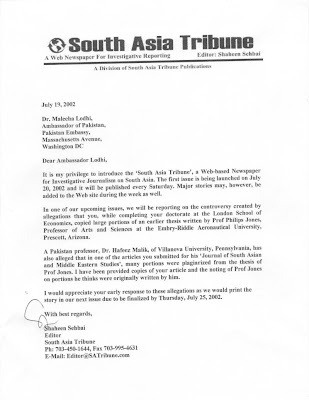 I take this opportunity to urge you that Pakistan’s Ambassador to the United States should be declared a persona non grata and sent home for plagiarizing extensively from Dr. Jones’s dissertation for (1) an article, “Pakistan Peoples Party and Pakistani Democracy,” which I as the Editor published in the Journal of South Asian and Middle Eastern Studies Vol. VI, no. 3, pp. 20-31, Spring 1983), and (2) her own doctoral dissertation on “Pakistan Peoples Party and Political Development in Pakistan: 1971-77,” which she submitted to the London School of Economics and Political Science in 1981. Dr. Jones, who is currently a faculty member at Embry-Riddle Aeronautical University, Prescott, Arizona, has confirmed: “I would estimate some 60-70 percent of this paper reproduces ideas and approaches used in my Ph.D. thesis.” Specifically Dr. Jones indicated pages, 306, 307, 620, 623, 655, 658, 661, 665 of his dissertation from which the material has been plagiarized by Ambassador Lodhi. Incidentally, Dr. Jones’s dissertation is an impressive as well as a massive piece of scholarly work consisting of 775 pages. Upon the publication of her article, Dr. Jones discovered the extent to which his dissertation had been plagiarized. Consequently, Ms. Lodhi called him on the telephone to apologize. She completely ignored the Editor of the Journal, that is me. However, my investigations have convinced me that there is prima facie evidence that she has very substantially plagiarized Dr. Jones dissertation to complete her own. Consequently, a representation is being made to the London School of Economics and Political Science that they should establish a faculty committee to determine the extent of Ms. Lodhi’s plagiarism. If it is extensive, then a determination should be made to withdraw from her the Ph.D. degree. All relevant documents are attached for your reference, including a copy of my memorandum to Ambassador Lodhi. I might as well point out that since 1966 I have been Professor of Political Science at Villanova University, and the Editor of the Journal of South Asian and Middle Eastern Studies since 1977. Also, I have authored/edited thirteen books on the foreign policies of the United States, and Russia toward the Middle East, South Asia and Central Asia. These books were published by reputable universities and commercial publishers in the United States and Britain. Against this background I must emphasize that I have discussed these issues relating to Ambassador Lodhi with a full sense of responsibility. Recently Professor Stephen E. Ambrose and Doris Kearns Goodwin, two well-published historians’ plagiarism was highlighted in the national press. They suffered consequences for their thoughtless scholarly work. Maleeha Lodhi who has stolen the intellectual property of an American scholar must be taught an appropriate lesson. It is for this reason that I have suggested that she should be declared a persona non grata and sent home. 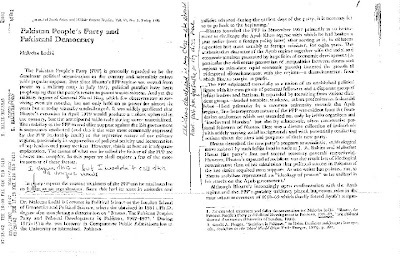 SUBJECT: There is prima facie evidence that Maleeha Lodhi’s doctoral dissertation, “Bhutto, The Pakistan People’s Party and Political Development in Pakistan, 1971-77,” submitted to your faculty in 1981 was very substantially plagiarized from the doctoral dissertation of Phillip E. Jones---“The Pakistan People’s Party: Social Group Response in an Era of Mass Participation,” submitted to the faculty of the Fletcher School of Law and diplomacy of Tufts University in April 1979. 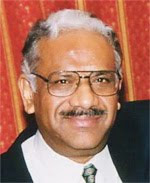 I am the Editor of the Journal of South Asian and Middle Eastern Studies, and Professor of Political Science at Villanova University, Villanova, Pennsylvania since 1961. In 1983 I received a letter from Maleeha Lodhi requesting that her article, “Pakistan People’s Party and Pakistani Democracy” may be published in the Journal. Also she indicated that the article was based upon her doctoral dissertation, which she had submitted to your school. In good faith I believed that the article would be based upon original research, which doctoral dissertations are supposed to be. Consequently, I published her article in the Journal (Spring 1983, Vol. VI, No. 3, pp. 20-31). For your reference a copy of the Journal is enclosed. A few months ago a knowledgeable person alerted me to the fact that her article as well as her dissertation were extensively plagiarized from Dr. Jones’s dissertation, which had been completed two years before her thesis was completed. 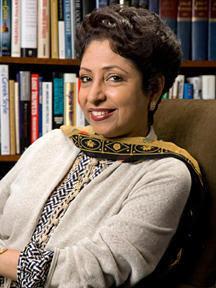 It is now established that a friend of Maleeha Lodhi had fetched Jones’s dissertation from the United States to London. As you can see, Lodhi’s adviser(s) had no way of knowing that a doctoral dissertation on the role of Pakistan People’s Party had been completed and submitted to the Fletcher School of Law and Diplomacy two years before the completion of Lodhi’s thesis on the same subject. When this matter was brought to my attention, I contacted Dr. Phillip Jones, who is at present a faculty member of Embry Riddle Aeronautical University, Prescott, Arizona. He confirmed the fact that Lodhi had plagiarized material extensively from his dissertation for her own doctoral dissertation as well as the article, which I had published. In a memorandum of September 19, 2002 Dr. Jones stated: “I would estimate 60-70 percent of this paper reproduces ideas and approaches used in my Ph.D. thesis.” A copy of his memorandum is enclosed for your reference. Dr. Jones referred specifically to the pages, 306, 307, 620, 623, 655, 661, and 665. A copy of this article is also enclosed for your reference. At this stage it is difficult to determine exactly the extent to which Maleeha Lodhi did plagiarize from Dr. Jones dissertation in preparing her own for your school. There is prima facie evidence that Lodhi flagrantly stole Dr. Jones idea and approaches, and even language, and incorporated them in her own dissertation. In light of this, I urge you to establish a faculty committee, which should determine the extent of her plagiarism. If it is extensive, (as we believe it is), then the Ph.D. degree should be withdrawn. I assure you that I have the highest personal regard for the London School of Economics. It is as offensive to see your fine reputation besmirched by this deception as it is for the Journal of South Asian and Middle Eastern Studies to be abused in the same manner. While it is regretful that these representations may cause some degree of discomfort, rectitude and academic integrity demand that the Lodhi case be thoroughly investigated. You can obtain a copy of Dr. Phillip Jones’s dissertation from the Fletcher School of Law and Diplomacy of Tufts University on the Inter-library loan. If it is inconvenient, then I will be glad to send you a Xerox copy of this dissertation, which is in my possession. o get to the bottom of the story SA Tribune contacted both Dr. Philips Jones of Arizona and Dr. Maleeha Lodhi for their versions on the subject. He also revealed that Ms Lodhi "did write to me from London about the time the article was published and apologized for the failure to attribute." As to the plagiarization of his thesis, Dr Jones was cautious in his comments to SA Tribune and stated: "I have never seen this document and I do not know if Dr. Lodhi made use of my thesis in an inappropriate way. There are rumors, but I know of no one who has actually seen both these side by side. Now that the issue has been raised by Prof. Hafeez Malik, the only way to resolve it is to place both documents side by side and see. If there has been plagiarism, it would be up to the LSE to take appropriate action." But he extended his support to an investigation saying: "I hope such an investigation would show there is no plagiarism in her thesis and the matter could then be put to rest." All these documents and claims, and the total silence in Ms Lodhi's camp, indicate that as a student she did commit a mistake, phoned in a feeble apology to Dr. Jones and then forgot about it, hoping that the matter would never be raised again. She could hardly have imagined that two decades later, when she would be occupying an important public position and preparing to go into political life in her home country, the ghost of an innocent, or may be not so innocent, mistake of her youth, will come back to haunt her. But it apparently did so only because she was not deft at handling people and could not stop from reacting to even mild, non-specific criticism. The final chapter of this unpleasant drama may, however, be written by the London School of Economics, if it thinks its reputation had been put at stake. Please keep one thing in mind while going through the article below that Mr Shaheen Sehbai had complained about the Falling Standards of The News International in 2002 [the standards fell when Mr Shaheen Sehbai resigned during Musharraf's Tenure in 2002] now standard of The News International is again risen since Mr Shaheen Sehbai has agin joined and now it can be compared with The New Yorker/ The Washington Post and The New York Times. 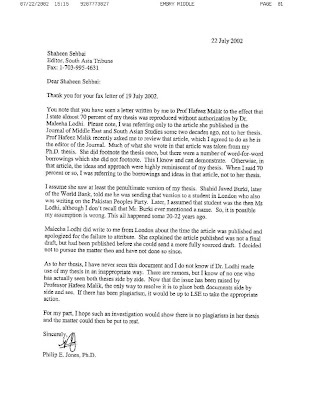 Mr Shaheen's Magazine's story above on Dr. Maleeha Lodhi declares that her work is plagiarized and now note that the same Shaheen Sehbai tolerating her 'plagiarized' columns in The News International. What a shame.